Cover 2 baking sheets with parchment paper and place the pastry puff discs on the trays, and pierce them using a fork. Bake for 5 to 8 minutes, and repeat until all the pastry discs are done. 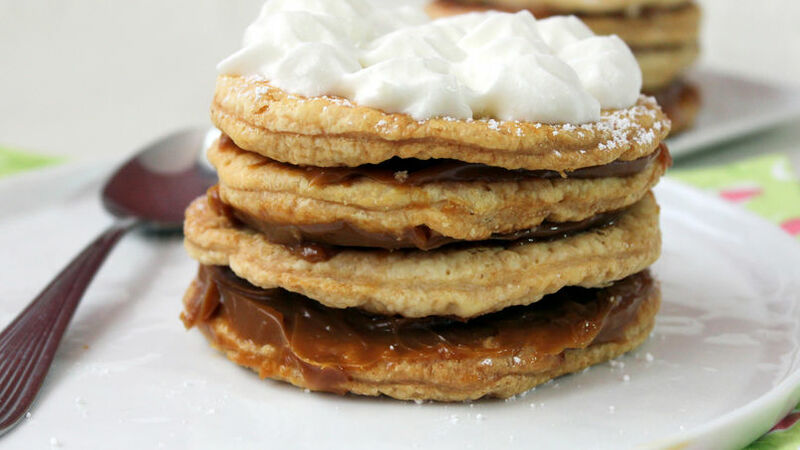 Let the pastry cool and cover each disc with dulce de leche, creating as many layers as you wish. Top with powdered sugar or whipped cream, if you prefer. If you want thinner pastry puff discs, flatten the dough with a rolling pin. This is my take on the delicious and traditional pastry known as milhojas. This very popular dessert is ideal for fans of dulce de leche and pastry puff. You can use whichever filling you prefer, such as whipped cream or pastry cream. You can also garnish with fresh fruit, powdered sugar or chocolate.